What will it take, people? Not one single phone call, and our ladies are getting a bit restless. If "cougars" are in, then all the guys should jump at the chance to be with this ... er ... leopard spotted tiger? 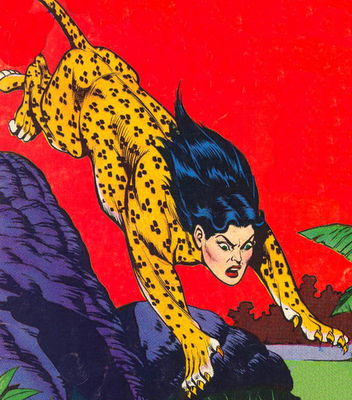 I guess animal reference pictures were hard to come by in the golden age of comics! This athletic lady is a work-out queen who has powerful hind-quarters and loves to run, jump, play, and especially scratch the living hell out of your couch. She will purr like a kitten if you rub her the right way, and has a tongue that comes in handy for exfoliating skin and tearing chunks of meat out of mice, rabbits, giraffes, lounge singers, home appliance repairmen, and that guy that did Somebody is Always Watching Me song. What was his name? Rockwell. Yeah, Rockwell. It's not off-topic! She's jumping off of rocks, and doing it well. Ha! Now who has egg on their face? Frankly, why should I even bother, none of you call! You know how much meat this lady eats everyday? Look, I'm sorry, this job is stressful. Please call, she's leaving fur everywhere.